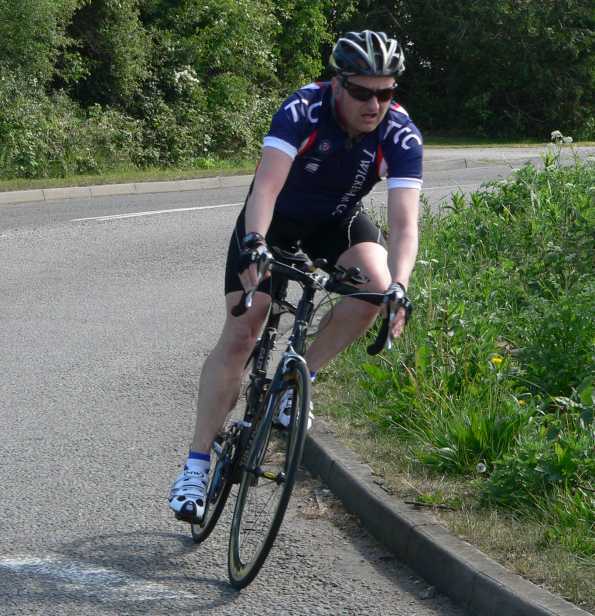 I was pleased to see a number of riders in Twickenham shirts at Hillingdon this week. Steve Home and Damon Yates were to ride the E/1/2/3 race and Ve (Wiesa Kuczaj) was there to join me in the 4ths. 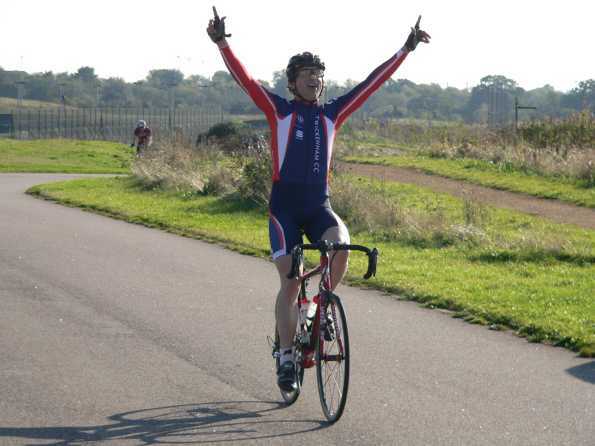 To the start – My strategy for racing at Hillingdon had remained unchanged for the previous six races. Essentially my aim was to stay out of trouble and to achieve this was to stay in the top ten riders throughout. I discovered last week that staying near the front requires effort as the group continual rotates. My objective this week was to do no work whatsoever, even if this meant taking my chances at the back of the group. I would move forward once the E123s had passed for the second time. The race was relatively uneventful. There were a number of the usual break attempts but the stiff wind blowing down the back straight sapped the energy from anyone trying to slip away. I stuck to my race plan and trundled along at the back of the group. Once in a while I ventured forward to team up with Ve, who was looking comfortable and strong in the middle of the bunch. The E123s came past, without incident, for the first time after 15 minutes. We continued for a few more laps whilst riders affected by the crash sorted themselves out, either physically or mechanically. I hadn’t seen Ve in a while and hoped that she had not been caught in the crash. 3 Laps to go – I was in the middle of the group when the final laps began to count down. I just held my position. I didn’t want to go backwards but equally I didn’t want to get to the front too soon. The pace was fairly quick but I was pedalling well within my limits. I adopted the strategy of holding the left curb as we took to the final lap. I did not want to let other riders pass me on the left and I expected the line to open up as riders drifted right through the final left hand bend. This strategy worked and gaps started to appear. I picked the wheel of a rider who began to attack as we commenced the final rise to the finish. I made my move as we entered the “S” bends and I couldn’t believe how quickly I closed in on the leading riders. Four of us lunged for the line and we must have all gone through within half a bike length. It turned out that I’d pick up 3rd place and, more importantly, the points required for a 3rd category licence. Ve’s race had been compromised by the incident and although she did not crash, she lost touch with the main peleton and chose to save her energy for racing the Women’s Series at the weekend. Steve Home came 10th in the E123 and Damon Yates finished safely in the bunch having narrowly escaped both the crash in the 4ths and another crash in the E123 bunch sprint.